A new report from the Justice Department's Bureau of Justice Statistics (BJS) shows that prior drug use among state prisoners is essentially unchanged in the last decade, while prior drug use among federal prisoners is up slightly. But in presenting the report, Drug Use and Dependence, State and Federal Prisoners 2004, BJS emphasized small increases in prior methamphetamine among state and federal prisoners. That is at least in part because that's what BJS' clients were interested in, said report author Chris Mumola. "We have a lot of increased demand for information on methamphetamines," he told Drug War Chronicle. "The Office of National Drug Control Policy and correctional administrators want to know about that population." 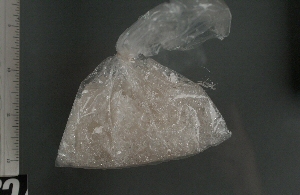 What BJS found regarding meth was that 7% of state prisoners reported using it in the month previous to arrest in 1997. That figure increased to 11% in 2004. Reported meth use among state prisoners at the time of the offense increased from 4% to 6% during the same period. Federal prisons reported similar increases. Among white prisoners, a full 20% reported using in the month before arrest, compared to 1% of black inmates. Among Hispanics, 12% of state prisoners and 5% of federal prisoners reported meth use in the month prior to arrest. Among women, 17% of state inmates and 15% of federal inmates reported using, compared to 10% of men in both the states and the federal system. More broadly, the report found that a majority -- 56% -- of state inmates used drugs in the month prior to arrest, with 40% reporting marijuana use, followed by crack or powder cocaine (21%), stimulants (12%), and heroin and other opiates (8%). These state figures are essentially unchanged from 1997, the last time the survey was done. Interestingly, violent offenders were less likely to have used methamphetamine than either drug or property offenders. Only 4% of violent and property offenders reported using in the month prior to arrest, compared to 14% of drug offenders. That makes intuitive sense -- and it also raises questions about just what these figures are telling us. Do the rising figures for meth use suggest rising meth use rates, increasing law enforcement attention, or both? BJS wasn't much help. One employee -- not Mumola -- would say only, "We don't do sociology. There is no way of determining that." "I don't think we know whether this is the result of rising use or rising enforcement," said Marc Mauer, executive director of The Sentencing Project, a criminal justice think tank that emphasizes alternatives to incarceration. "We do know there has been a lot of targeting of resources at meth enforcement in recent years, but that could indicate a greater focus on meth at the expense of other drug law enforcement. This may not indicate any rise in use or sales, but in arrests. We also don't have a good grasp on the extent of meth use, which varies from region to region. It could be important in San Diego, but not in Philadelphia," he told the Chronicle. Mauer was struck by the report's emphasis on meth. "It's sort of odd that they highlighted this so prominently," he said. "If you look at the overall distribution of drugs that people in prison have used, meth is on the low end. While there are some people in prison who used meth, it is still a modest number. Highlighting those figures plays into the whole public discussion about whether there is a meth epidemic, but when you look more broadly at the whole range of drugs used by prisoners, you get a very different picture." You could also get a very different picture of prior drug use by prisoners if alcohol were included in the survey, as it was in 1997. BJS does it clients a disservice by failing to include alcohol use, said Mauer. "You can't talk about criminality without talking about alcohol," he exclaimed. "In terms of violent crime, there is much more of a correlation with alcohol than with other drugs. If you want to look at comprehensive substance abuse policy, you are omitting half the problem if you don't look at alcohol." The reasons for omitting alcohol were not sinister, said BJS's Mumola. "The 1997 report was 16 pages, and this time we had to cut it to 12," he explained. "We had to edit it down and make it more focused. At the same time, there was both increased demand for figures on meth and new measures of dependence and abuse. There is high demand for making better assessments of who needs treatment, so there was a lot of additional content we had to squeeze in, and it would have been impossible to give full treatment to alcohol issues, so we streamlined it." One thing the report did not mention, but that could be teased out by examining this and other BJS reports on prison population is that there are more than 44,000 people serving prison sentences for marijuana offenses. In a Thursday press release, the National Organization for the Reform of Marijuana Laws (NORML) crunched the numbers. "According to these figures, nearly 45,000 state and federal prisoners are behind bars for having committed some type of cannabis-related offense," said NORML executive director Allen St. Pierre. "This means that US taxpayers are currently spending over $1 billion annually to incarcerate Americans for pot." But let's not think about that. Instead, let's concentrate on the demon drug du jour. That's what BJS and it's client-driven research did.